Urban streetwear has been a big hit with men and women of all ages for about a year now. Who can resist looking ultra-chic while being comfortable at the same time? For awhile now, cool, statement tees have been my best friend and go-to clothing for days when I'm hit with a brickwall and can't decide what to wear. They go great with anything and you can easily dress them up and down to be "occasion appropriate". Relying mostly on the print, some can be trickier to pair but none are as versatile and effortless as this "Coco Made Me Do It" shirt! First, in my book, Coco can do no wrong. Second, black and white is as basic as it can get, go high contrast with bright colors or keep it monochrome, it's up to you. Third, Coco is timeless which equals to a timeless statement tee that will never go out of style! 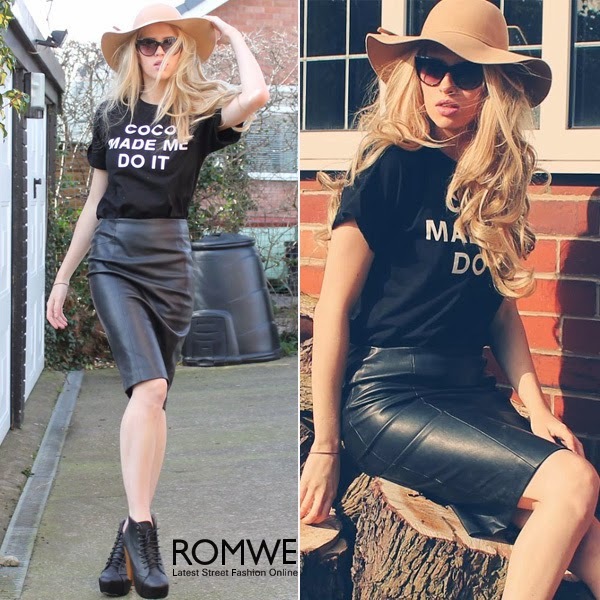 Now the best part, a chance for you to own ROMWE's "COCO MADE ME DO IT" t-shirt for FREE! ps. Get first dibs on this cool tee on March 13, 2014. For 24 hours only, this tee will be on SALE for just $9.99, use this special coupon code (10%offcoco) to get an additional 10% off when you check out. Hi! This giveaway is amazing!! The shirt is so cool!! Hi, I haven't twitter and instagram. I have fb!